Andreas Raptopoulos and his colleagues at Matternet are attempting to create a network of drones that operate like the internet, only for tangible objects. This company — which sprung out of an idea surfaced at Singularity University in 2011 — aims to deliver items wherever they are needed, even if no usable roads go there. Andreas Raptopoulos: No roads? There’s a drone for thatAndreas Raptopoulos: No roads? There’s a drone for thatIn today’s talk, Raptopoulos explains why a system like this is needed — to reach the one billion people worldwide who don’t have access to all-season roads. 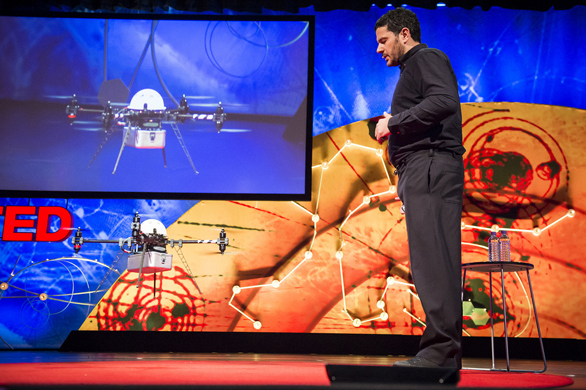 He also wowed the TEDGlobal 2013 audience when he landed one of Matternet’s drones on the TED stage, smack dab in the middle of the red carpet. This week, he told the TED Blog more about the Matternet concept. Matternet is a big idea. Below, read the real-world applications — two that Matternet has field tested and four that are still concepts. Delivered supplies, information and diagnostic tools between medical centers. Around the same time, Matternet ran its second field test in the Dominican Republic, flying supplies and diagnostic tools from big healthcare centers to smaller ones in remote areas, and zipping samples back for analysis. They hope to turn this test into a year-long project to improve healthcare service for the poor and low-income populations of Samaná, where 60 percent of people live in rural areas. Paola Santana, Raptopoulos’ co-founder at Matternet, told the TED Blog, “We’re working with one of the big development banks in the region to fund this project.” And while they haven’t field tested there, Matternet has also thought a lot about Lesotho, and how Matternet could connect HIV/AIDS clinics there to provide better care and faster tests for patients. “While the battle against the disease is being won in most of the world, it’s being lost in Lesotho,” says Raptopoulos. Create a courier service that can’t get stuck in traffic. In both Haiti and the Dominican Republic, Matternet tried this, though on too small a sale to be considered a trial. “Port Au Prince has few roads and they are quite congested,” says Raptopoulos. “Several years after the earthquake, tens of thousands of people still live in temporary shelters and camps — as is typical in many regions that have experienced a natural disaster.” As for Santo Domingo, he says, “It’s an emerging city, growing quickly, and roads can get very congested in peak hours.” Now, to get hypothetical, imagine this in megacities like New York or Tokyo. Deliver food. Matternet could also be very effective for getting food and water to areas that need it, especially in times of disaster, war or crisis. The trick here will be increasing Matternet’s load size. Currently, it is able to transport a two-kilogram load, covering a ten-kilometer distance in 15 minutes. As the weight-bearing ability increases, this use will become more and more viable. What are drones? A infographic.